In the world of premium content, you can’t get away from DRM – technologies that prevent you from accessing content in an unauthorized way. Take Spotify as an example, Spotify Free users must hear adverts in between tracks, listen to music in Shuffle-only Mode, five tracks skips per hour and can’t stream music offline. Premium and Family users can’t enjoy Spotify music on MP3 player, car player, etc. All this is because Spotify encodes its music with DRM protection. Is it possible to download and stream Spotify music free without any limits? Luckily, people have found a powerful freeware -- Spotify Music Converter Free, which can help them download and stream Spotify music offline for free. In this article, we will review it in full aspects to tell how it works. What is Free Spotify Music Converter? 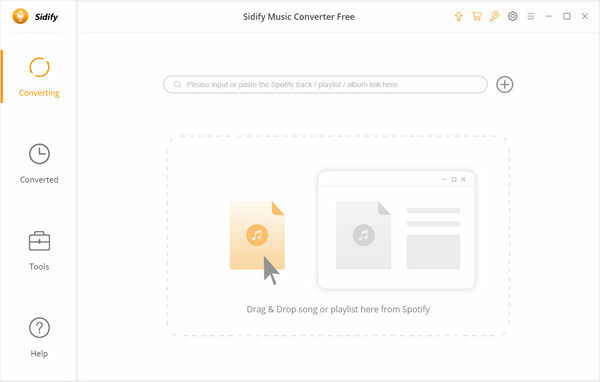 Spotify Music Converter Free is a newly released program by Sidify.Inc. Built with advanced encoding technology, Spotify Audio Converter Free is definitely a pretty good choice if you need to download and stream Spotify music for playback offline without subscribing to Spotify Music service. It not only has the ability to download Spotify music to MP3 file, but also can convert Spotify music to AAC, FLAC or WAV format for different needs. In this case, whether you are Spotify paid or free user, you can play the Spotify music offline on any MP3 player, AAC compatible music player, mobile device, home sound system, car radio, and so on. It’s neat and clean user interface is a plus point. Featured with a cream and gray-colored interface with a slight touch of the green, this Spotify music downloader looks quite appealing. All the options are neatly placed along the corners and edges of the Windows. Spotify Audio Converter Free is completely free, which means you can download Spotify music to your computer for playback offline without paying any cost. 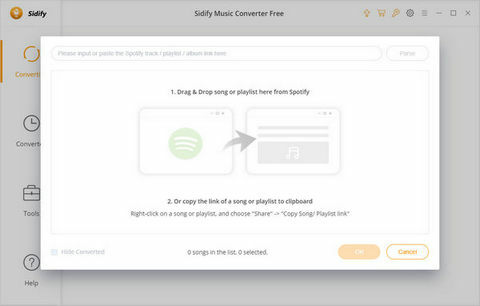 Sidify Music Converter Freeware is specially designed to let users download and convert Spotify tracks or playlists to popular formats like MP3/AAC/WAV/FLAC. The real handy part about Spotify Music Downloader Free is that it supports to burn your Spotify music to CD directly without the need of installing other CD burners. This freeware supports to share Spotify music with Family member or friend via email after conversion, thus they can enjoy Spotify songs on any media player without installing Spotify application or signing up to Spotify. 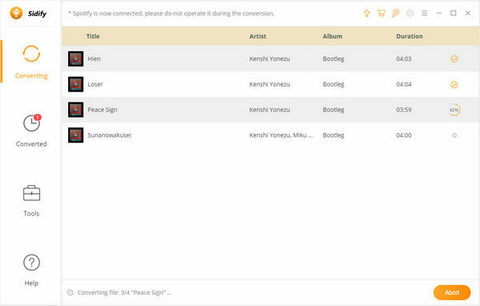 This program can not only convert a Spotify playlist in bulk, which would save you tons of time, but also retain ID tags, the Artist and Art Cover after conversion. One of the things that you’ll love about Free Spotify Music converter is that it is easy to get started. You can download Spotify tracks/playlist to MP3, AAC, WAC or FLAC file quickly within a few clicks. The program is only available for Windows users currently. Click button or click center of Sidify, a new adding music window would pop out. You can directly drag Spotify music to Sidify program or copy Spotify music URL from other sources to Sidify adding music window. After recognizing and adding the music files, click the button on the upper-right corner, and then you can adjust output format, output audio quality and output directory. 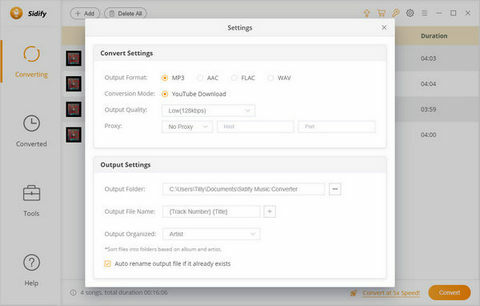 In setting window, you can choose output format (MP3, AAC, WAV or FLAC) and output quality (320kbps, medium 256kbps, low 128kbps) or change the output folder as required. If you do not need to change output path, the output audio files will be saved under the default folder. Once saving the settings, click "Convert" button to start conversion. This Spotify audio downloader are encouraged from some Spotify music who wish to enjoy Spotify music offline while at same time saving their money. However, there are still people who want to stream Spotify music on more devices and passionately pursue the highest sound quality in their playback equipment, and are willing to spend some of their income to get lossless DRM-free Spotify audio, then the Pro version of Spotify Music Downloader is a great tool to complete the task. The following list is a comparison between the two versions of Spotify Music Converter. For more detailed description of the Pro version features, please visit the Spotify DRM Removal Pro page. Free Spotify Audio Downloader is a great porgram and performed solidly based on repeated tests. You can give Spotify Music Converter Free a try if you’re in need to free download and convert your Spotify music. 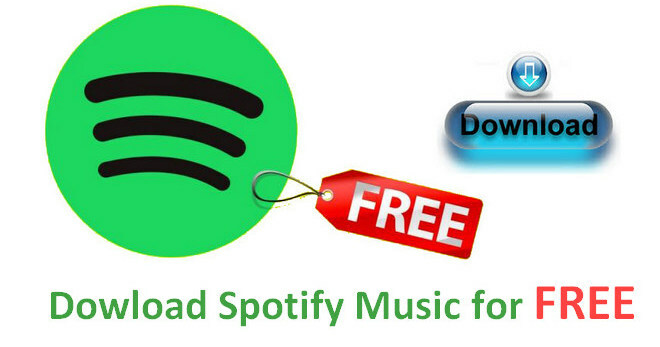 It can be a great choice among all the Spotify downloaders, because this freeware can help you free download Spotify music without upgrading to Spotify Premium plan.